In compliance with Transport Canada’s safety notice closing Canadian airspace to Boeing 737 MAX aircraft operations, Air Canada has grounded its 24 737 MAX aircraft until further notice. Air Canada is now updating its April and May schedule to further optimize its fleet and re-accommodate customers. Because the timeline for the return to service of the 737 Max is unknown, for planning purposes and to provide customers certainty for booking and travel, Air Canada is removing all 737 MAX aircraft from its schedule until at least July 1, 2019. A summary of schedule changes for April is posted below in the following question and answer: “What is Air Canada doing to reschedule customers?”. Additional schedule changes will be posted as warranted. If you currently have a reservation for a flight that was scheduled to be operated by a Boeing 737 MAX aircraft, we've implemented a policy that makes it possible for you to make voluntary changes to your itinerary within three (3) weeks of your original travel dates. I’ve been rebooked on an Air Transat flight. Where should I go? Air Canada confirmed today that it will comply immediately with Transport Canada's safety notice closing Canadian airspace to Boeing 737 MAX aircraft operations until further notice. Air Canada's cancellation and rebooking policies are in place with full fee waiver for affected customers. We are working to rebook impacted customers as soon as possible. Given the magnitude of our 737 MAX operations which on average carry nine to twelve thousand customers per day, customers can expect delays in rebooking and in reaching Air Canada Call Centres. Priority will be given to customers travelling within the next 72 hours. We appreciate our customers' patience. If you'd like to know what type of aircraft you are flying on, simply retrieve your booking from the My Bookings tab, then click on the 'Details' link in the Flight Details section. We also advise you to check the status of your flight before heading to the airport. We fully support Transport Canada's decision and will continue to work with them towards a resolution of this situation as soon as possible. If you currently have a reservation for a flight operated by a Boeing 737 MAX aircraft, we've implemented a policy that makes it possible for you to make voluntary changes to your itinerary within three (3) weeks of your original travel dates. If you are impacted by this policy, you may contact Air Canada Reservations (1-888-247-2262). If you purchased your ticket with AeroplanExternal site which may not meet accessibility guidelines., or Air Canada Vacations or your Travel agent, please contact them directly Some questions you may have are below with our answers, but if you can't find what you need, contact us at 1-888-247-2262, or reach out to us on on FacebookExternal site which may not meet accessibility guidelines. or TwitterExternal site which may not meet accessibility guidelines..
Air Canada has a fleet of 24 Boeing 737 MAX-8 aircraft, which have been in operation since 2017. We have a total fleet of 400 aircraft (including 24 737MAX), comprising Air Canada mainline, Air Canada Rouge and Air Canada Express aircraft. These aircraft operate flights across North America, to Mexico, the Caribbean, Hawaii, as well as from Atlantic Canada to London Heathrow. We typically operate approximately 75 Boeing 737 MAX flights daily out of a total schedule of approximately 1,600 daily flights system-wide, representing less than six percent of our total flying. We have a total fleet of 400 aircraft (including 24 Boeing 737 MAX), comprising Air Canada mainline, Air Canada Rouge and Air Canada Express aircraft. We are making adjustments to our schedule to minimize the disruption to customers as much as possible, by optimizing the deployment of the rest of our fleet and looking at alternative options, including accommodating customers on other airlines. As an example of some of our adjustments to Boeing 737 MAX flights cancelled, we have re-scheduled widebody aircraft to serve Hawaii starting today, March 13. Some flights will operate as scheduled with mainline or Air Canada Rouge aircraft, such as on Montreal-Martinique and Montreal-Guadeloupe. Other routes, notably Halifax-London and St. John's-London are cancelled in the short term, with customers being re-routed through our Montreal and Toronto hubs. If you are travelling soon, you can also contact us or your travel agent. Please understand that priority is being given to customers travelling within the next 72 hours. We have also put in place a rebooking policy, space permitting, and without additional fees for affected customers. Given the magnitude of our Boeing 737 MAX operations, which on average carry nine to twelve thousand customers per day, customers can expect delays in rebooking and in reaching Air Canada's Call Centres. If you would like to know what type of aircraft you are flying on, simply retrieve your booking from the My Bookings tab, then click on the 'Details' link in the Flight Details section. If you are travelling soon, you can contact us, reach out to our social media teams on FacebookExternal site which may not meet accessibility guidelines. or TwitterExternal site which may not meet accessibility guidelines., or call your travel agent. We thank all of our customers for their patience. Our normal protocol for irregular events which are out of our control is in effect. We are regrettably unable to reimburse for such expenses. MONTREAL, March 13, 2019 /CNW Telbec/ - Air Canada confirmed today that it will comply immediately with Transport Canada's safety notice closing Canadian airspace to Boeing 737 MAX aircraft operations until further notice. Air Canada's cancellation and rebooking policies are in place with full fee waiver for affected customers. We are working to rebook impacted customers as soon as possible but given the magnitude of our 737 MAX operations which on average carry nine to twelve thousand customers per day, customers can expect delays in rebooking and in reaching Air Canada call centres and we appreciate our customers' patience. We are working to rebook impacted customers as soon as possible through our Montreal, Toronto and Ottawa hubs. Affected customers may contact Air Canada Reservations to change their flights to another date free of charge. As well, due to anticipated call volumes, customers can expect delays reaching Air Canada call centres, so we appreciate our customers’ patience. Air Canada will provide updates as more information becomes available. I'm doing YUL - YVR and YVR - MEL tomorrow. My flight AC 039 (787-8) has been cancelled. They replaced it with AC 1991 on a Air Canada Rouge 767. 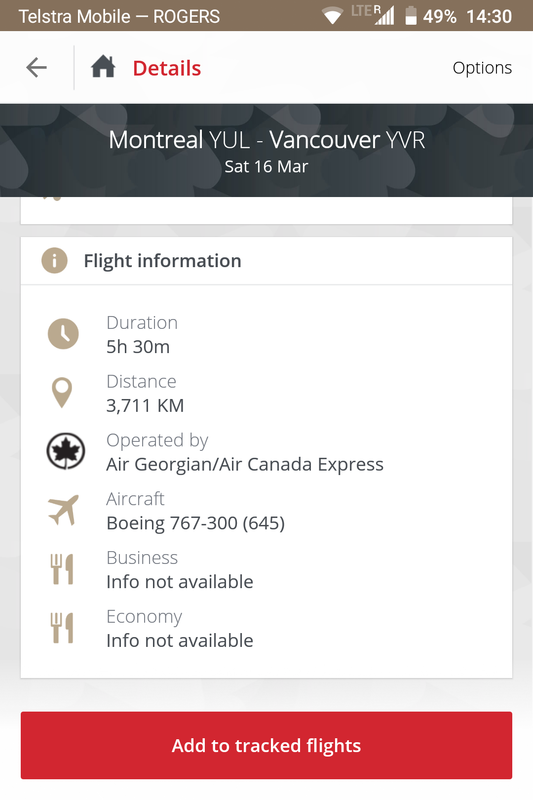 I know the circumstances are out of Air Canada's hand and there's not much to do, but is there anything I can do since I've been rebooked on a lower class, on a route that wasn't directly affected by the 737 MAX ban? I'm a little confused with some of this information. YVR-MEL is AC 37 and usually a 789 - and way too long for a 763 (rouge or otherwise). I am assuming that the downgraded sector is YUL-YVR? I have a flight to HNL from YVR this year in July and I was wondering. Do you 'think' the 737 Max will fly at that time? Currently they have a 77W on the route which would have been sweet but July is a long way ahead so I guess they will solve the problems until then but I understand it's just guessing at this point. I don't really have a problem flying the Max since I'm pretty sure pilots will get a good amount of briefing/update now regarding how to handle such situations considering what has happened. Are you asking for a guess or a guarantee? The same question would apply to all airlines that have the MAX. The restart of flying may vary a bit by airline, depending on software upgrade, repositioning of aircraft etc. As others here have posted, July is really too far out for an answer. The same question would apply to all airlines that have the MAX. The restart of flying may vary a bit by airline, depending on software upgrade, repositioning of aircraft etc As others here have posted, July is really too far out for an answer. Not sure what I was hoping for, an opinion or so. I am not really inserted in what the issue is and how complicated it could be to fix it so I guess I will have to wait and see. I really like the Max overall and flew it a few times without any problems (in Europe) but considering the two accidents I understand they have to restrict it and investigate. Lets hope they find a solution for the issue so the plane can fly again. Great. So around 58% then. How long could Boeing theoretically survive this grounding? Surely they must be sued for billions of dollars from airlines all over the world? Does any form of insurance cover this kind of situations? Well, that might be a discussion for another thread but surely this must hurt Boeing a lot. The financial press, the aviation publications and others are all speculating on the loss. But they are still building the MAXs to fill the orders they have (5,000 give or take). Lion Air is suing them for other reasons. Norwegian is also, or is threatening to, as it grounded their fleet. AC only has 24 now, 36 by summer as others have posted here. I would think there is a penalty airlines have to pay if they cancel their orders but it's not like there is large market of other aircraft or second-hand spares to buy that will meet the needs of all the airlines with grounded aircraft. I'm sure the lawyers and the airlines and their insurance companies have this in their clauses/contracts. Others here with legal/financial background can correct me and add info. Who said that the max would be back in the air? If SFO-YUL is a profitable route for AC, they will figure away to start flying that route shortly. This max grounding will soon show which route are the profitable for AC. The routes AC is not making money, will feel the majority of cuts. Nothing personal here. AC currently does not have enough planes to operate its route network. My opinion (and it's only an opinion) is that SFO-YUL will be cancelled until the Max returns to service and AC will chose to route passengers thru YYZ instead. How would you plan to look after this asap if everything is changing daily? Well, since OP is flying SFO-YUL-MCO, I think the somewhat obvious solution is to try and get rebooked on UA/LH SFO-Europe-MCO and avoid Max routes completely. OP said they'd prefer this option anyway. I'm guessing AC might like this solution too and it will be a win for everybody. AC128 YVR to YYZ is full with 119 people on the standby list and 54 for the upgrade list. IIRC there isn’t much (if any) refund for your situation. If you were flying purely domestically I believe there is a surcharge for Signature Class over Business that could be refunded, but that isn’t applicable for an international itinerary. You can always write into ask after your trip, as technically you were downgraded. Plus, being on rouge is a downgrade itself. I am due to fly YYT-LHR April 24th. What do you think chances are they have replacement planes or 737 back in the air by this time? The alternatives really aren't great, I am trying to convince AC to book me through to Munich instead of London (plan was to get cheap flight from london to munich) but they seem to be unwilling to change destination. Good news...you haven't been "Rouged"
FIN 645 is rouge 767. Also the fact it says Express/Georgian indicates it is rouge due to a differing airline code (I think ZX? ).